Oundle Town Under 16s are pictured before their 6-0 win over Netherton. From the left are , back, Joseph Searle, Tom Clark, Alex Lloyd, Matthew Bonnett, Joshua Bonnett, Bram Kochuijt, Jamie Wade, Michael Sarris, Jack Peet, front, Joe Murphy, Peter Mansfield, Thomas Filby, Haiden Cobley, Devontae Lucien, William Harris and Noah Wykes. Oundle Town Under 16s gave their championship hopes a massive boost on Sunday. 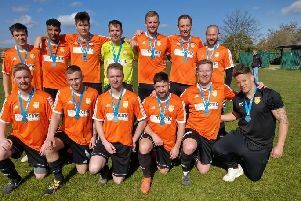 The unbeaten Northamptonshire side entertained Division Three leaders Netherton United and romped to a 6-0 win to put themselves firmly in the title window. Netherton United Under 16s are pictured before their 6-0 defeat by Oundle Town in the Peterborough Youth League. From the left they are, back, Ewan Champion, Ivan Deboisia, Isaiah James-Jordan, Jamie Worsdall, Dylan Kochanowski, Silvio Assuncao , William Gould, Lucian Stiopli, front, Benjamin Denton, Edward Gray, Cai Morgan, Hakim Samaoli, Christian-Gabriel Maghiar and Rafael Rodrigues. They share second spot level on points with Hempsted with both teams a point behind Netherton. But while Netherton have completed their fixtures, Oundle have three games still to play and Hempsted two. Substitutes Devontae Lucien (2) and Michael Sarris were on target against Netherton along with Thomas Filby, Bram Kochuijt and Joseph Murphy. Hempsted kept their honours hopes alive by winning 7-2 against Werrington thanks to goals by Jacob Hoffmann (2), Aaron Wills (2), Matthew Melton, Joshua Howard and Lewis Harwood. Action from the Under 16 game between Oundle Town and Netherton. In Under 18 Division Two it’s looking good for Peterborough Sports. They maintained their five-point advantage at the top of the table with two games remaining after thrashing Ryhall 4-0. Hot-shot Jordan Hammond helped himself to another hat-trick and Roman Paterson got the other goal. Between them they have netted 36 goals this season - Hammond hitting 19 and Paterson 17. Under 16 Division One pacesetters Peterborough Northern Star Blue were in Northants county cup semi-final action on Sunday and made it through to the final by outshooting Wellingborough Town Lions 3-0 on penalties. The game finished 1-1 after extra-time with Ayman Trabelsi hitting the Star goal. They will play Corby Kingswood in the decider. In the big game in Under 16 Division Two, table-topping Ketton came unstuck 2-1 against second-placed Gunthorpe. Alesio Hoxha and Tyler Nightingale grabbed their goals with Marcus Flanagan on target for Ketton.